BOC Argoshield & Air Products bottles are expensive to hire/exchange, due to bottle rental agreement. Linde Gas UK has recently bought BOC (25-02-08). Air Liquide from France are entering the market, with lower rental agreements, hopefully this should help push prices down! (29-07-07). You can use CO2 as a shielding gas for Mig welding mild steel but not for stainless steel due to carbon contamination from carbon dioxide, carbon monoxide is created from the heat in the weld pool. Using CO2 as a shielding gas converts MIG welding (metal inert gas) to MAG welding (metal active gas). Active, being the absorption of carbon into weld pool from the carbon monoxide expelled from the heated shielding gas. I prefer pure CO2 for welding on rusty cars and exhausts. Argon shielding gases with 5% CO2 does give a better looking flatter, wetted weld bead (Argoshield light & Cougar 5). But I find pure CO2 runs a cooler weld pool with a narrow profile weld bead and I have less blow thru problems! From a chemistry point of view. When welding carbon impregnated used exhaust parts with 0.6mm A18 MIG wire. The MAG (metal active gas) process of pure CO2 MIG welding dilutes some of the carbon into the weld metal. But for good looking MIG welds on new clean steel, Argon gas mixes from 5% to 20% CO2 and 2% Oxygen are far superior. As a car mechanic I use about three 6.25kg CO2 bottles to every one 20ltr Argon 5% CO2 bottle. Ready source's of bottled CO2 are pub gassing bottles cellar gas, tavern gas & sureflow. Do not use bottles with nitrogen in them, these are grey bottles for cream flow beers and Guinness called sureflow mixes. Pub bottles weight 17.25kg when full, 11kg when empty, dimensions are 94cm high x 14cm Ø diameter and they are black in colour. Any black pub bottle marked CO2 with a white stripe down them are for liquid with-drawel and thus is no use for welding. Another source of CO2 are 4.7kg fire extinguishers. Most fire extinguisher suppliers will refill bottles. Some pubs now use full size CO2 bottles! 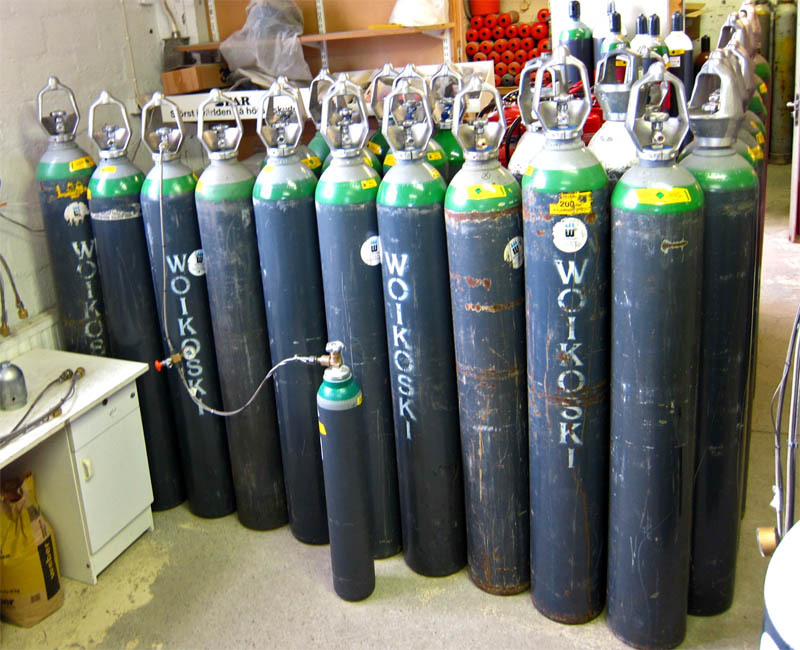 The size of industrial W-size oxygen (50ltr), argon/argoshield welding bottles, weighing 85kg gross, dimensions 146cm high x 23cm Ø diameter and contain 11710 litres of gas. CO2 pub bottles show about 50bar (750psi) at 15°C when full and have a 5/8 bsp male threaded fitting. Standard argon bottles have 5/8bsp female fitting designed for a male bullnose fitting. So an adapter for an Argon regulator or dedicated CO2 regulator is needed. Adapters available from Ebay for about £12. CO2 when compressed turns into liquid-ish fluid, thus the low bottle pressure, propane/butane & LPG acts very much the same. When contents of the bottle turns from liquid to a gas it lowers in temperature, due to process of gas transfer from a liquid state. Thus you may experience some weld splatter as the cold shielding gas hits the red hot weld pool. You can overcome this by fitting a CO2 heater directly threaded to the bottle before the regulator. I use a Murex Sirocco heater, purchased from an ex-Mod sale. At very high flow rates i.e. building ships/bridges, CO2 will have to be heated as the low temperatures cause vapor locks and damage to regulators/gas lines. Splatter is also caused by the Arc voltage increasing in CO2. A different process of Mig welding, takes place above <200A in CO2, this is called spray transfer, this has some good side effects i.e. improving weld penetration in really thick plate. If you, can't live with a bit of splatter on thin plate when using 0.6mm A18 wire, you will need Argoshield Lite from BOC, Argoshield Lite also leaves the weld bead with a flatter profile than CO2, which is handy when welding repair patches on cars, saving time on post weld grinding. Most low amperage (>150A) Mig/Mag welding will need shielding gas supplied to torch at a pressure of 1.5-2.0bar (20-30psi) and a volume of 5-7 litres a minute, when welding outside in windy conditions will require more gas, about 10 litres a minute and/or physically shielding your welding with a jury rigged windshield, made from plywood. A Bobbin Type Flowmeter to set the flow rate between regulator and mig torch is a must for economical usage of gas. It will pay for itself very quickly. More expensive MIG welders have spot welding timers, I have never used it and consider it to be a total waste of money. You will need a special nozzle shroud with slots in the side of it, to use it anyway. I own a Miller CV (constant voltage) compact 151. High amperage MIG welders are a waste of money unless you are doing production runs! If you want to weld the odd thick thing up, use an ARC welder (MMA). Welders with reverse polarity function are handy for using different types of wire i.e. gasless (flux cored). Solid wire sizes 0.6mm to 0.8mm are needed for all auto repair work (I only use 0.6mm A18 wire). Spools come in 0.5kg 5kg 15kg sizes, 5-15kg size far cheaper if you are going to do any amount of welding. Most people buy a MIG welder far bigger than they actually need, they never get to use all the amps and duty cycle repairing cars. Alumininium, stainless steel and mig brazing must be done in pure argon. Helium (balloon gas) can be used for MIG-TIG welding really thick alloys, its messy with lots of splatter, but the weld penetration is very good. Gas transfer from one bottle to another. CO2 is a fluid and its very difficult to achieve gas transfer and Argon bottles are pressurized to 230bar (3450psi) when full (Gas direct bottles are 300bar). Which would cause a oblivious safety hazard for the connection pipe! Connecting/gas transfer pipes are available from scuba diving kit outlets thou. Pressure bottles need to be secured/chained upright or stored lying down, if one falls over and knocks the valve off, you will get a torpedo bouncing about your garage! A point of interest is: in Europe adapters are available to refill 13kg 19kg 49kg Propane bottles via auto-gas-pumps, its a cheaper way of buying the gas than exchanging them. Gas transfer is possible and as you can see from picture below, with a little thought and a row of bottles, equalising pressure to 200 bar is possible if you work along a row of full ish bottles. MIG brazing. The Vectra-C model from Vauxhall has been built using galvanised steel plate. By using galvanised steel plate, Vauxhall are offering a longer body life through improved corrosion resistance. This in turn demands the application of new welding techniques, materials and processes in body repair and MIG brazing is a process that is used to braze together galvanised plates using a copper based MIG brazing filler wire (CuSi3) with a low melting temperature >920°C. Thus not removing the original galvanised coating. Spray on, weld thru nickel primer is now available for MIG welding galvanised panels with normal mild steel wire, which improves the rust prevention somewhat at higher temperatures. Expensive MIG brazing wire is available in 0.5kg or 5kg rolls. A short 3m MIG euro torch with a Teflon liner is needed & pure Argon is used a shielding gas. No gas MIG welding wire. Don't be tempted with no gas welding wire all though its improving all the while & the price of the equipment needed is very low. Its not very good on thin plate & car body work, due to the slag it creates. Its very good for heavy plate, spray transfer <200amps & when welding outside. The use it was designed for. Plus you will need a welder that has reverse polarity, gas mig torches are positive, no gas torches are negative. Real high amperage flux cored wire Mig welding above <400amps still use CO2 shielding gas to achieve higher arc voltage & thus deeper weld penatration. Alumininium MIG repairs to automotive type castings. If its broken you have nothing to lose by trying to fix it! Some types of alloy are not weldable i.e. high heat treated 7075 and some others. MIG welding alloy will need to be done in pure argon, back gassed if the item has a hole in it. The trick is finding a matching wire to the base metal. Not easy as only two types of wire available in 0.5kg spools 5% Silicon for cast alloy and 5% Magnesium for extruded alloy. Plus getting the item for welding very clean by removing the outside layer of oxide. Alloy MIG welding will need more amps as alloy transfers heat at a greater rate. A higher flow of shielding gas will be needed due to the oxidizing properties of aluminium. Preheating in an oven or a propane torch (not oxy/propane or oxy/acetylene) can save cracking when cooling. Most low spec MIG welders, work by dip transfer i.e. short circuiting the feed wire into the weld pool, which causes the DC voltage to act like AC, thus burning the oxides out of the weld pool. We have in the past welded cracks in cylinder heads, alternator bodies, motorcycle crankcases, with success using a MIG welder with argon/aluminium wire. If your going to do a lot of alloy MIG welding, a Teflon torch liner will make wire feeding a lot easier, most wire feeding problems are caused by having the feed rollers adjusted to tight, the wire needs to slip between them if the arc does not ignite. Alloy 0.8mm wire will need 1.0mm contact tip as the alloy wire expands so much with the heat from welding, causing torch jam-ups & wire feed motor birds nests. The big problem with welding aluminium is it does not change colour when hot, so you can't see the weld pool/bead very well. More expensive Mig welders are constant voltage, which works better for dip transfer at low amp settings! Oh... Welding alloy wheels up is just not safe! I have never done it or never will! MMA Alumininium (electric arc stick welding). SIF from Suffolk sell arc welding electrodes for alumininium, these electrodes are available in 2.5-3.2mm sizes, at a cost of about £100+ a box. Due to the very high silicon content of these rods we have used them with great success for gearbox-bell housing casing repairs. Downside is the molten weld-pool created by these rods, runs everywhere. Only option for positioning is down-hand, and constant repositioning of the work piece is required. These rods need to used with a DC welder. They are very difficult to use, they burn away so quickly. Be prepared for some filling and grinding to make the job look neat. TIG AC welding aluminium. I have owned a TIG inverter, Tec-Arc 200amp 240V model with pulsed DC, HF ignition, constant HF & variable AC waveform. The £1500 plus VAT was well spent, I think? (15-05-11). The inverter is high amperage and high spec for the money, its British made, so it has a warranty I can actually claim on, without the need to post it back to China. Being made in the UK, when the warranty does run out. I will be able to get the parts to fix it. Been very pleased with the welder. Not used it allot thou. All the car mechanics I know who own TIG welders bought them on a whim and never use them! (08-04-14) I would not buy another AC TIG set again! I used it more for MMA DC welding because it has adjustable arc force. The problem with TIG welding thick aluminium castings, aluminium absorbs so much heat, you really need a huge industrial set with a water cooled torch. (now sold 20-09-15). DC scratch start TIG. Modern DC inverters can be used for TIG welding with suitable valve type torch & argon shielding gas on mild or stainless steel, but not for alloy, you need AC for alloy. Low amperage DC TIG welding makes excellent fusion joints when welding new panels on cars, drill 2-3mm hole in new panel and weld on car without filler rod, just by melting edge of hole into weldpool with torch. Subsequent weld looks like factory spotwelding. For joining exhaust sections, I never use filler rods for the root pass, I just fusion weld them with a TIG torch, to achieve a gas tight seal. This is called autogenous welding! Then give them a second pass with a MIG welder to add strength. If I am repairing an old rusty exhaust, any subsequent holes I blow in the rusted metal, I then just melt the void together with the TIG torch, to achieve a gas tight seal. If you have ever attempted to repair old exhausts. It is not the thickness of the metal or rust which is the problem but the carbon build up inside, which causes a chemical reaction to your weld pool. Cleaning the inside if possible makes things easier, not possible on silencer boxes but possible on pipe section joins. Starting an arc with scratch start TIG welding is not easy without practice. HF ignition of lift start arc ignition is a very useful addition to any TIG welder, but it could add up to £800 to the purchase price. Mastering the art of scratch starting, will also benefit you with MMA arc ignition (electric arc welding). With plenty of practice, anybody can ignite an arc with a TIG torch, or with a welding rod in any position. But be prepared to get the Tungston or welding electrode stuck to your work-piece the first few times. The main advantage with scratch start TIG welding over HF ignition, is the ability to start an Arc under >20amps DC. There is nothing else, that will weld up an expensive bit of flexi exhaust pipe, >10amps DC "one blob at a time". Time served pipewelders use the welding filler rod to ignite the TIG arc to save getting tungston contamination in the weld pool to pass X-ray testing. Another interesting point is I now only now buy 1.6mm 309 or 312 stainless TIG welding rods and use them for everything! Mild to mild steel, stainless to stainless and mild to stainless steel. TIG HF arc igntion. Damage to car electronics! Even thou I have owned AC-DC TIG welders with HF arc ignition functions, I always use the lift start or scratch start arc ignition modes when welding, in situ on cars. The Kemppi Miniarc 180 Evo, I have just purchased is equipped with lift arc start and nothing else. It took me months of research to find a DC TIG with auto arc ignition, suitable for working on vehicles fitted with solid state electronics. The Kemppi works by raising the current not the votage wave form to ignite the arc. R-tech welders are also equpped with current excited lift arc ignition as well. Some makes of welding plant use arc ignition systems work by changing the voltage wave form. Old wives tales about removing the battery and disconnecting the alternator terminals are history. Capicitors will absorb energy if they are in the earth path of the welding circuit. Never-ever use welders with HF, hot start or anti stick functions on vehicles. As they can damage the cars electronics. Removing battery leads or using anti-surge clamps does not really reduce the risk. Positioning of the welding earth clamp as near to where you are welding as possible will reduce the risk of damage to electronic modules. The only safe method is gas welding using oxygen and acetylene. Most modern arc type welder have very high OCV voltages, stray HF energy gets everywhere. Oxy-acetylene welding leaves you with only one risk, which is setting the car alight. If something needs welding on a car and you can remove it, take it off the car and weld it away from the car! TIG Brazing. Excellent but little known process. All you need is DC scratch start welder TIG welder, plenty of Argon & SIF silicon brazing rods (non flux cored). Don't try it with ordinary brazing rods as they contain zinc which boils off and makes a real mess. Using a large-ish thoirated or ceriated tungston electrode of 1.6mm or 2.4mm in a TIG torch connected DC negative at about 25-30amps per mm of the metal to be joined. Because bronze rods melt at about 920ºC, mild steel rods melt at about 1450ºC, this process is perfect for joining or repairing dissimilar metals where lots of heat would cause cracking or distortion. TIG brazing is nothing like Oxy-Acetylene brazing with flux in practice, it is more like TIG welding steel but with a higher metal deposition rate. A very useful process & you may already have the equipment to perform it. Oh... At a push you can TIG braze with copper wire cut from normal household twin and earth cable. MMA (electric arc stick welding). Manual metal arc is too hot & fierce on car bodywork. But handy for making benches, trailers and tools etc... When using heavier stock metal. Anything but dry welding rods will cause problems due Hydrogen and Oxygen being introduced into the molten weld pool from damp welding rods. Welding rods must be stored in airtight containers or stored in a warm - dry place. Damp flux covered rods can be oven dried,150°C for two hours, don't tell the wife it was me who suggested it thou. I own a themostaically controlled rod drying oven (only because people give me batches of electrodes they stored in damp sheds). Modern DC inverter type power supplies, with reversible polarity are coming down in price all the while,130-140A enough for most repair work! It must be noted: that real thick plate repairs can be welded with a thin electrode at low amps using more than one pass, so who needs a bigger welder for a few repair jobs! Inverters are very small and portable, saving money on long leads. Duty cycles are not an issue for small repair jobs! DC welding is far smoother and more controllable than AC. I have a 210amp AC fan cooled Clarke welder (buzzbox). It has done a lot of work, it has earned me £thousands removing locking wheel nuts. I also own a Kemppi Miniarc 180 Evo DC. Easy strike arc, very smooth welding runs! Decent duty cycle! Everybody raves about Oxford oil coooled welders! Oil cooled welders may have 100% duty cycles, but they are too heavy and very difficult to strike an arc with! If you are learning arc welding, buy a DC set to play with! I am a motor mechanic by trade. In the motortrade everybody thinks MMA (arc welding) is history. Most workshops only have a low amperage dip transfer MIG set. Not many car mechanics under forty can stick weld. Click on this link to why MMA has a future. locking wheel nut removal. I am heavly into MMA (arc) welding. I spend allot of my time removing broken and rung off bolts! No other welding process can provide the instant and exact heat and fusion required to overcome bolt problems. In my time I have removed broken thread taps, sheared injectors and sparkplugs. The list is endless! It is a fact, you can get a MMA welding rod into places where you cannot get a MIG or TIG torch. Access with car welding jobs, sometimes dictates the welding process used. While I have never spent a fortune on MMA welding plant. I have bought and used every type of electrode (welding rods) from 6010 fast freeze rods to 312 dissimilar stainless rods. I even buy special 316LP 1.6mm x 250mm rods for welding up exhausts in situ. MIG has its place in automotive repair workshops, MIG is the only process for welding rusty bodywork. MIG is very forgiving when welding very thin, poor metal. In skilled hands most other automotive workshop welding tasks can be performed to a better standard using MMA with the correct electrode. There is a growing trend for young car mechanics to lay MIG weld beads down in a row of tacks, to make the welding look like TIG welding, this type of welding may look attractive but lacks penertration of a constant bead pushed forward of the torch (MMA welding is done dragging the weld pool away from the bead, MIG-TIG welding requires the weld pool to pushed in front of the bead to keep the molten metal in the gas shroud). Another valid point it set up time and consumable costs. My MIG is set up for A18 0.6mm wire all the while. If I want to quickly weld something thick up, it is qucker for me just to stick weld it, rather than change the wire and nozzles and gas in my MIG welder. Cast iron. Repairs with no pre-heating can be achieved using MMA with very expensive nickel/iron electrodes. Lincoln Electric Reptec Cast 3 2.5mm 50-70amps DC/AC negative polarity for electrode, positive for earth clamp, are the best we have found, at time of writing they cost £1.75 per electrode (29-05-06). Welding small runs of 30-50mm then allowing to cool before starting again. Arc brazing. Attachments for MMA welders using carbon arc electrodes have had their day, they give good results in well practiced hands, I never did master it. But this process has been superseded by the far superior MIG welding method. Plasma Cutting. Any low amperage plasma cutter (>30A) will be worth its weight in gold, if you do much car body work. One that can cut >3mm and severe >6mm is all you need. Be aware that neat cutting and severing are two different things. Plasma cutting uses less heat and is far neater than gas cutting. Its lots, lots easier than tin snips, quieter than a grinder and provide greater accuracy in situ than air powered shears or nibblers. You can cut any shape with one out of anything that's electrically conductive (alloys & steel stainless). But it has to be noted, you can buy allot of 4.5" grinding wheels for the price of a plasma cutter. Plasma cutters use dry filtered workshop compressor air, so are cheap to run once purchased. I do not own one! I cannot justify the purchase of one. I have on occasions, borrowed one from my friend, a Miller 40A model, which is a joy to use. I have also used several others including an ESAB ESP 150amp model to cut 50mm plate. Reason being, I got involved in a ships engine refit. This was no fun, all the sparks you can imagine while enclosed in a confined ships engine room, not recommended. Electronic welding headshield - clothing. Since purchasing an Optrel E680 auto darkening headshield. I have seen vast improvements in my welding. I actually start the arc/welding where I intended. It is adjustable from 4-13 and is solar powered. Most MIG-MMA welding is done on number 10-11, 9 for TIG and 9 for plasma cutting. As no awkward nod down is required, these type of headshield are a must when welding under cars. Good leather gloves are a must, and covering arms from intense light created from electric welding will save you from sunburn/cancer and some of the inevitable minor burns from sparks/spatter. I also own a Lincoln welding jacket with leather arms. (01-01-15) I have bought a Speedglas 9100x, plus I paid extra for the extended head and throat protectors. My Optrel helmet, is fitted with a Centurion Concept reduced peak hard hat with Optrel mounting adapters-ratchet headband plus leather throat protector. I am fed up banging my head under cars! Car mechanics don't weld long enough to justify expensive air fed welding helmets. The biggest problem is overhead welding splater burns and banging your head on the vehicle being worked on! All helmets do need front cover lens changed on a regular basis! Me... Dressed for the job! My Speedglas 9100x and my Optrel E680 with hard hat attached! Arc-Eye. I have ever never had arc-eye. I have thou have had several UV light burns to my neck area when welding overhead. So every helmet I buy, now have throat protectors fitted. Arc-eye is not nice. I have been told, it really hurts! Like sand being poured into your eyes at two AM in the morning. Oh... Dogs get arc-eye as well. Plus they are very attracted to the light, as they see in black and white. Welding blanket. A must when welding car body work, to protect paintwork and autoglass from welding splatter, I have a £40 fibreglass one and an old old large piece of leather (half a cow skin), source unknown but works just as well. Welding blankets are not for just protecting cars, when welding in the kneeling position, I often drape a welding balnket over my legs and sensitive bits. MIG feed wire - TIG filler rods - MMA electrodes. Most cheap extruded wire is made form scrap metal in an electric arc furnace. Which the metal content is unknown, your welding will be much improved if you use good quality rods/wire, with a known metal content. Matching parent metal to filler rod is the key to good metal fusion. I have in my time fabricated steel boat hulls, fuel tanks, bits of microlights and pressure vessels. To trust the integrity of the welds and for safety's sake, an extra few pounds for a box of fresh dry rods is a small price to pay! Thou cheap A18 MIG wire has its place i.e. welding repair patches on rusty cars. One thick coat of black underseal makes anybodies welding look good enough to pass an MOT. TIG welding opens up more options to be inventive with filler wire. I have used short lengths of MIG welding wire cut off a spool before. I have even knocked the coating off a MMA arc welding rod to make a filler rod to match the parent metal to be welded when desparate. Also on a sheet metal job, I once cut a very thin strip of the sheet metal and used that for filler rod. Oxygen/Propane Cutting & Heating. We do not do any Acetylene gas welding now and have never used MAPP, Propylene or Apachi gas, its useless because it's just not hot enough for welding. I like gas welding & I'm good at it, only because I've done so much of it i.e. rusty cars & miles of pipework. But with the advent of MIG/TIG and MIG brazing, gas welding maybe history in the automotive repair trade (22-05-06). Not due to fact gas welding is an inferior method but only because electric processes are faster & cheaper. We only use cheaper Propane (LPG) with oxygen for cutting & heating with a cutting torch fitted with a pepperpot nozzle. Propane will need PNNM type nozzles, not ANMM type, as used with Acetylene. Propane will provide enough heat for freeing fasteners, swelling bearings/housings and cutting up to 12"-300mm thick in mild steel. Hydrogen can be used for a fuel gas, but it's more suited to machine cutting! Don't let anybody tell you Propane is no good for cutting. I thinks its better. Gas cutting is a chemical process, the extra cost of Acetylene is wasted. Control is what you are after, as this saves you time cleaning the cuts up with a grinder. Propane will burn as hot as Acetylene, but to get the BTU rating you have to use a larger nozzle. The reason Propane cannot be used for gas welding is not a lower heat output, but he lack of CO2 created in the flame causes a lower shielding compared with an Acetylene flame. Never use gas welding/cutting equipment, without hose check valves on the torch end of good hoses and flashback arrestors on the regulators. Oxygen/Acetylene gas welding. I have not done it for years! But things may have gone full circle for this process in my garage! (20-09-15) I am beggining to think we may re-invest in a Oxy/Acetylene weldng set, only due to the safety it provides against electrical damage to modern car electronics! Nine years ago I wrote above "gas welding is history". Well nearly a decade later, I really think for a quick tack or in situ repair job. The extra time saved in not having to make things electrical safe. Makes gas welding a very viable automotive repair process now. My thoughts on this subject have gone in a full circle! Regulators for high pressure welding cylinders. I only use "in date" multistage regulators on 200bar + bottles. This includes Nitrogen bottles for air-con leak testing! But for low pressure Propane and Co2 bottles I use single stage regulators. Multistage regulators are accurate and do not change output pressure when the bottle pressure-temperature changes, this saves loads of gas and pays for the higher price regulator very quickly. Always get into the habit of turning the bottle off at the valve you you have finished welding! It makes the bottle safe and saves gas by preventing leaks. I do not have welding bottles in use at my workshop without being secured to a trolley! Most accidents in industry involved with pressure cylinder use, are caused by unsecured bottles falling over and knocking the regulators off with the valve open. It is called "torpedo syndrome" for obvious reasons! Cylinder trolleys are cheap, they last for years. The use of cylinder trolleys prolongs regulator and hose life! Trolleys just make everything easier! Body soldering. You will need a standard plumbers torch with a 3.9kg propane bottle. The bottle needs to be fitted with adjustable regulator & a nice long hose. Bullfinch torches are the industry standard, with different size nozzles & thus differing heat outputs. Mine is decades old, and spare parts are still available! I use a 1250 nozzle with mine. Small portable propane plumbers bottles are just too expensive per litre of gas and diy blowlamps are just a frustrating toy. It has to be noted that we use a propane plumbers torch nearly as much as we use oxygen/propane for heating things up to free them in our workshop. Alloy loaded two pack polyester bodyfiller or non alloy loaded Plastic Padding is the modern alterternative to body soldering or lead loading, black or dark grey in colour. Both modern replacements are non water absorbent and vibration proof, which is the quality you are looking for when back filling bare metal under normal polyester grey finshing bodyfiller. Chopped fibreglass filler/matting is history and only reserved for mending boats or cars with fibreglass body (I want a TVR). It's just too messy & time consuming, MIG welding a repair patch and over filling it, is now the industry standard. Alloy loaded filler is too thick too be used for finishing! It times gone past, lead loading was finished with cellulose putty, which shrinks when drying, causing more problems. Welding plant & electrical supply. If money was no object. I would just buy brand new Fronius welders. These are the Rolls Royce of welding plant! Super designed, high quaility welders at very high prices. I think at the present time for light trade use (automotive repair). Kemppi or Tec-Arc is the your best choice! For hobby use R-Tech is the best value for money! (27-09-15). Buying un-named welding plant from Italy or China with no warranty of spares back up in the UK, to me is just buying trouble! You will note I only buy welding plant that run off 16amp single phase supplies! I am a car mechanic not a ship builder. What I want is portable welding plant with acceptable duty cycles! I only use a very few welding processes. MAG (MIG) at low amps with A18 0.6mm wire. DC TIG with 1.6mm tungston & 1.6mm 309 filler rods. DC TIG brazing using 1.6mm filler rods. DC MMA arc welding > 120amps with a several different types of rods & sizes. In the real world of car repairs... I would have more use for a Oxy-Acetylene port-a-pak than I would a £5000 "all singing all dancing" digital AC TIG set! Good welding owes itself more to practice. Than owning lots of expensive equipment! Miller MAG (MIG) set uses pure CO2 with a gas heater. It will take a full 15kg roll of wire and is fitted with a 4m Euro torch & 5m earth return lead. Both welding sets were chosen as they will run flat out on 13amp socket! Both have very high duty cycles! AC 210 amp buzz-box wheel nut removal trolley. 16amp supply needed. Kemppi Miniarc 180 Evo. 16amp supply needed. Cable cradle was made out of some scrap stainless. This welder was chosen to use MMA Elga Cromarod 316LP 1.6mm x 250mm electrodes between 18 and 35 amps DC. I also use the Kemppi for "lift arc ignition" TIG welding and brazing. Note: Kemppi hand held remote. Very handy when fusion welding in situ! Miller 150CV MAG (MIG) with pure CO2 & gas heater (two bottles, one in use and one spare). Clarke 210TE AC MMA on a trolley with long leads. Kemppi Minarc EVO 180 with remote and valved WP17V TIG torch with 20ltr pure argon bottle. Mosa Magic II 150amp DC 110v generator petrol welding set with short leads (29kgs). Oxygen-Propane with Saffire cutting torch and large size welding-heating nozzles. Dewalt 5" grinder x2 (240V). What would I buy next? Arc-Gen 165 with an electric start petrol Robin engine (Suburu) or another Mosa Magic II (again more dependant of funds Arc-Gen £3000 Mosa £2200). Small Oxygen-Acetylene port-a-pack with a lightweight welding only torch kit (toying with the idea).